As Andy and others pointed out, being in the top 1% of Linkedin profiles puts you in the top 2 MILLION members. Not a club that’s as exclusive as NFL quarterbacks, or Super Bowl half-time show performers, or even “people who can make a really, really good omelette.” Despite the sheep in wolf’s clothing nature of the 1% announcement, many social media participants (including Kyle, he readily admits) did a little #humblebrag chest thumping and posted about it. But to me, the more interesting byproduct of the LinkedIn campaign is the pillorying of people who posted about their 10/5/1% designation. Just about anyone in the social media cognoscenti who had the unmitigated gall to mention they were in the top 1% on LinkedIn was instantly besieged by smarty pantses pointing out that it was only the top 2 million, and how foolish the whole exercise was, and how dare they post about it, etc. This is what is wrong with social media. Yes, it’s an interconnected world; Facebook and its brethren have succeeded in tying us all together like a digital cats cradle. But just because you see someone’s Facebook status in your stream, or see their tweets from time-to-time, or stumble across their LinkedIn updates, does NOT give you (in my estimation) the right to unilaterally attack them and tell them they are “doing it wrong.” A Facebook status update isn’t a blog post with a comments section; it’s not an invitation for your bile and vitriole. 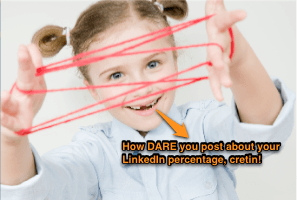 If you don’t like that someone posted about their LinkedIn profile percentage – or anything else for that matter – so what? How have you been wronged? Your recourse is to scroll down, hide, delete, or unfollow. It’s not as if they mailed a cobra to your house, they just posted something to a public social network that you don’t prefer. Get a grip. Make the punishment fit the crime. And most importantly, as I learned in kindergarten: Worry about yourself.